KHIMKI, Russia (AP) — Opposition activists hoped to make gains in thousands of local elections held in Russia on Sunday, but supporters of President Vladimir Putin appeared likely to retain their hold on the positions despite somewhat looser election rules. The Kremlin eased stiff election laws in response to massive winter protests against Putin's rule, but introduced new restrictions after the demonstrations abated. As things stand, Kremlin-approved governors and mayors are expected to preserve their seats and the ruling United Russia party will likely keep dominating local legislatures. In one of the most visible races Sunday, opposition activist Yevgeniya Chirikova was challenging the Kremlin-backed mayor of Khimki, a town just outside Moscow. Chirikova, an organizer of the anti-Putin protests, has complained that authorities tried to thwart her meetings with voters, among other obstacles. On Sunday, she filed two petitions in court — alleging her rival broke campaign rules and that election officials manipulated voter lists at a polling station. Authorities rejected her complaints, and it was unclear when a court could issue its verdict. Chirikova won fame a few years ago by conducting a fiery campaign to save a local forest from being chopped down to build a highway. She lost that battle to powerful commercial interests, but has since become a prominent opposition figure. Her campaign reflected challenges also faced by other opposition candidates in nearly 5,000 local elections held Sunday in 77 of Russia's 83 regions. 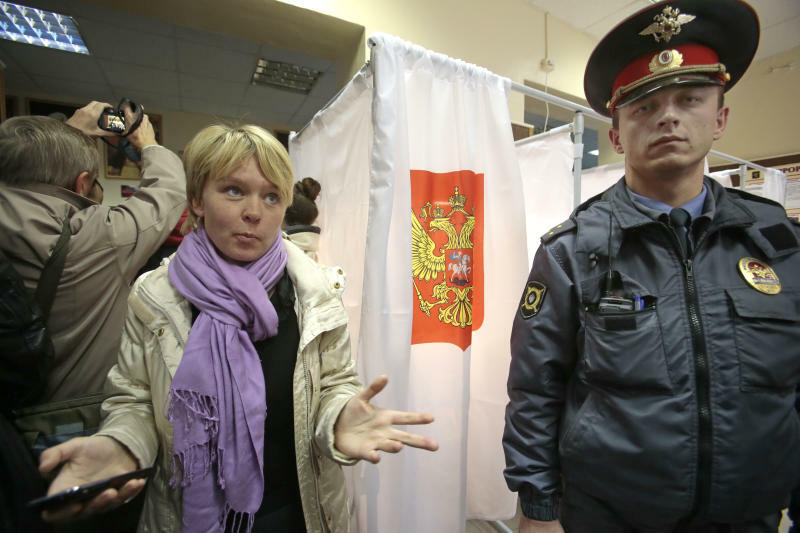 After the protests that drew more than 100,000 people to the streets of Moscow, the Kremlin restored direct elections of provincial governors, which had been abolished by Putin nearly eight years ago. But after Putin won a third presidential term in March, the government put forward new requirements to retain control. For instance, the Kremlin introduced "municipal filters," which obliged would-be gubernatorial candidates to get approval for their bid from 5-10 percent of members of local legislatures. With most local legislators heeding Kremlin orders, the requirement made it hard for many opposition candidates to enter races. As a result, incumbents are facing only token competition in gubernatorial races held Sunday in five provinces. The governor's race in the Ryazan region at one point seemed less sedate than others, with Gov. Oleg Kovalyov facing a rival backed by another pro-government party. But challenger Igor Morozov eventually threw his support behind the incumbent in exchange for a promised seat in the upper house of the federal parliament. The lack of real competition has contributed to public apathy, and voter turnout is expected to be low in many regions.